Well, shepherdess mom (and dad if truth be told) finally got a chance to get pictures of me and my babies. The one above shows me with my darling charges. The one on the left is the ram lamb and the one on the right is the ewe lamb. Here's a shot where you get to see their cute faces a bit more close up. Now the ewe is on the left and the ram is on the right. If you notice the ewe has a white mark between her eye and nose. They little guy has marks all over his face, hence he's blettet. Well, better get going and feed myself to keep producing milk! Hi, my name is Sabbath Farm Sassy Too and I'm the cutie with the feminine looking horns right in the middle of the picture. Of course, this was taken just before I was sheared this year. I gave my shepherdess mom quite a surprise this early morning. I know that she'd been dying to see more lambs, as she's been hanging around us girls so much lately. I thought that this morning would be my chance to surprise her. Unfortunately, she came out to the barn and peeked in on us girls and found me with two babies at my side at 2am. I was still in the process of cleaning off my second and was caught red handed. Okay, I don't have hands, I guess you could say I was caught mid lick! My first lamb is a ram and he's the cutest looking guy with a greyish looking body (he'll probably turn into a musket color just like me) with blettet markings on his face and flecket markings on his body. My second lamb is a ewe and she's got a cute brown face and a darkish brown looking body. She'll probably also look just like me, but time will tell. I know that shepherdess mom is trying to get some great photos of my babies, so I'm sure those will go up on this funny page as soon as she's got the best ones. Well, carrying and birthing two healthy, adorable babies is great, but I'm all tuckered out now. I think I'll step away from the computer and take a little nap. Got to keep my strength up to take care of these lambs now. This is my first time with lambs, but so far shepherdess mom says I'm doing just great. Hi, it's Mulan again with a picture of my ram lamb. Isn't he a cutie pie? Below is a picture showing his adorable light colored belly. Below is his sister's face shot. She's an adorable black girl (her tongue is a nice purplish/black. Sylph and Sassy Too are looking quite large. The sheperdess mom is hoping they'll be the next to lamb. I'm just content to be out of my lambing jug into a larger mixing pen. This makes me more comfortable when shepherdess mom enters the pen. Hi all, my name is Underhill Mulan and I'm a fading grey Shetland sheep (Ag for some of you). My shepherdess seemed to be hanging around me waiting for more than a week for me to lamb. My motto is "within due time". Just yesterday turned out to be the day. At approximately 4:50ish in the afternoon, I gave birth to two bouncing lambs. Each weighed a little over 5 pounds. The one on the left is a ewe who appears to be a black color. The lamb on the right is a ram who may be a musket (oatmeal) colored sheep. Time will tell their true colors. I'm as happy as can be as now I get some animal crackers for all my hard work. I believe my shepherdess will take more pictures of my babies and hopefully get some shots of their adorable faces. Thanks for listening. I'm such a proud and attentive mom. Welcome to Contented Butterfly's first blog post. Today the shepherdess is posting as the sheep are sick and tired of all the snowy rain and have refused to come to the computer. 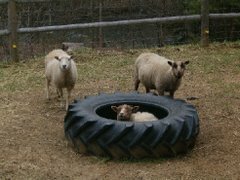 We are a Shetland sheep farm in Windsor, Vermont. Generally speaking this blog is for the sheep to speak about their experiences on our farm.